Custom-made wallpaper provides excellent opportunities for care homes and nursing homes to introduce visual imagery that can benefit residents with dementia and Alzheimer's disease. 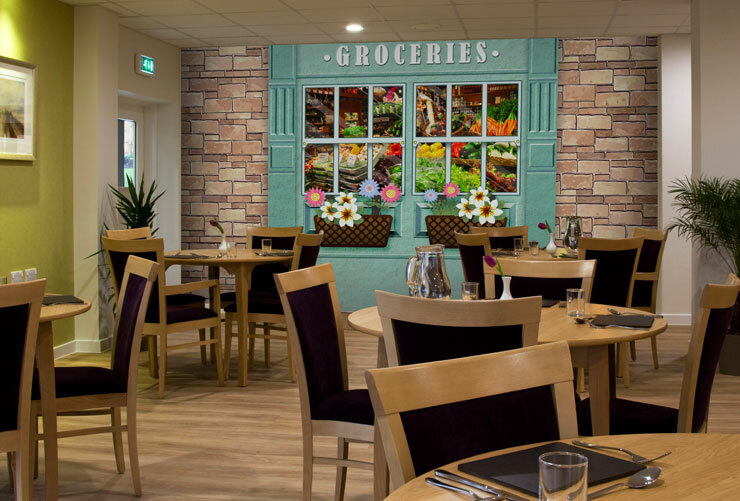 With an increasing focus on the development of care home environments and the provision of activities for people living with dementia more and more care providers have been looking at what can be achieved with care home wall murals amongst a range of options. In recent news, The Telegraph featured an article on how Five Rise Nursing Home in Bingley has created a Coronation Street style parade of shops. In the hope of providing an attractive and interesting destination that can offer reminiscence therapy to their residents, the nursing home has featured familiar sightings of Bingley that resemble the town in the 1950s. Over the past years, Wallsauce com has been creating and supplied many wallpaper murals for care homes. 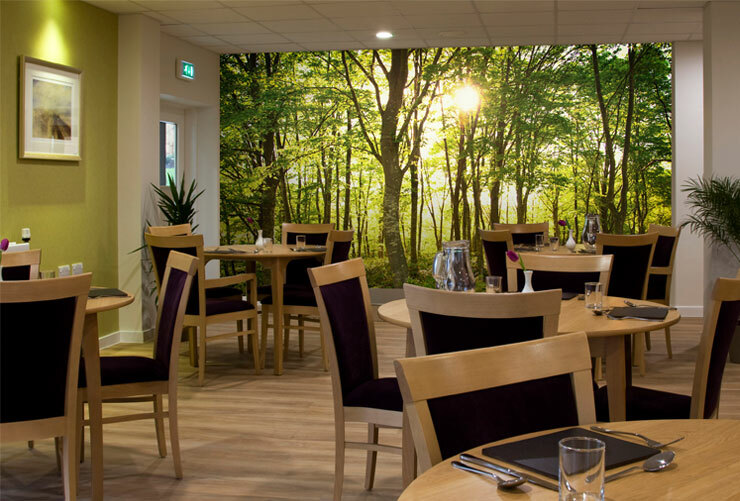 With a wealth of excellent feedback from our customers in the care industry, we’ve brought our knowledge from experience and gathered it into this blog post to help additional care homes improve its décor with memory filled wall murals. Read on to discover some of our most popular wall murals for care homes and décor ideas. As highlighted in an article by the BBC back in 2014, old photography can have real benefits in triggering memory and reminiscences amongst people living with of dementia. 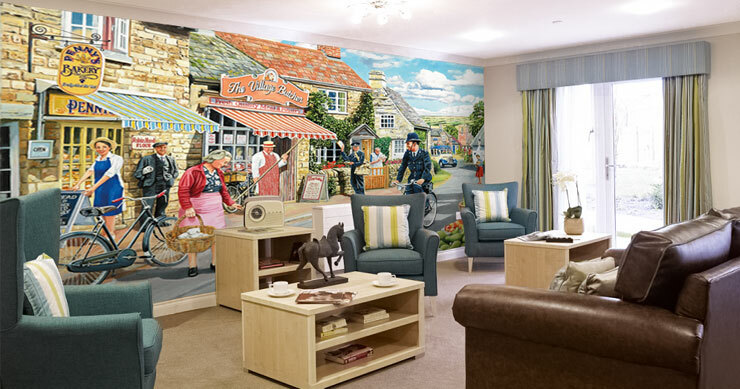 So it’s no surprise that we find a number of care homes requesting murals using historical imagery that depict their local towns from bygone eras and scenes from the 1950s and 1960s. In our vast collection of care home murals, you’ll discover many images of inner-city, post-war streets and residents. The Owls Care Home in Blackpool, fittingly chose this Blackpool themed mural by Kevin Walsh. 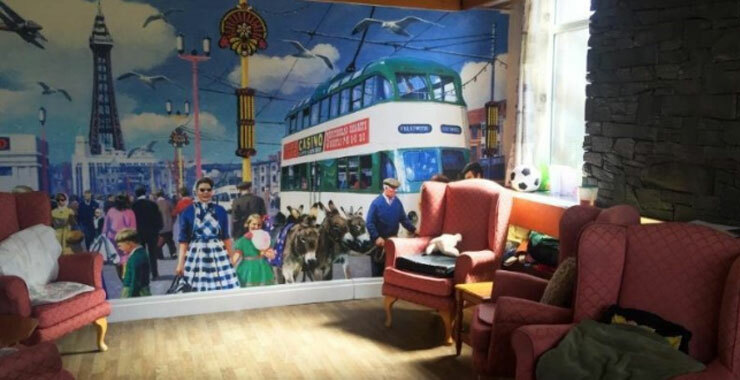 Dating back to an era their residents may remember, this bygone era mural is a great example of how historical imagery can work in care homes. Baylham Care Centre in Ipswich has been another home, building replica shops as reported in the Daily Mail article 'Shopping in Memory Lane'. Boasting a butcher's, bakery, sweet shop, post office and a train station the set was to create a familiar space to help keep residents calm and give the residents a sense of ‘normal life’. In the Netherlands, this example has also been widely reported. Yvonne van Amerongen created Hogeway, a ‘dementia village’ in Amsterdam that composed of a miniature town with all the typical Dutch touches. Many of our customers’ also report that their residents living with dementia take comfort in completing everyday tasks that feel familiar. We find that they recreate their own replica shops with our care home murals. 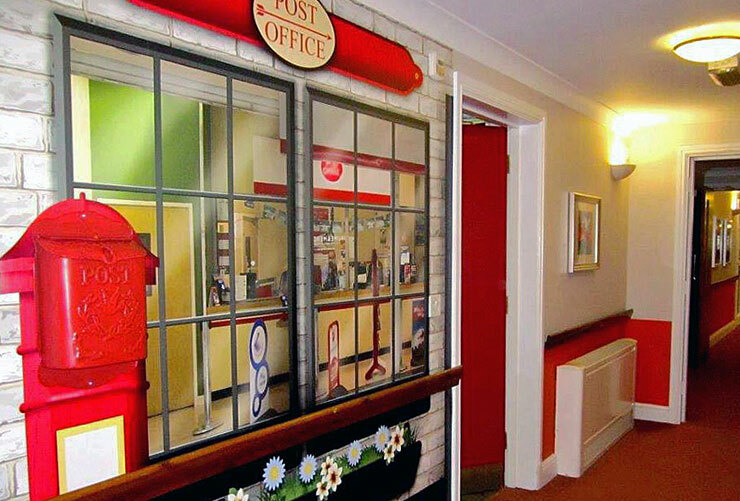 From a post office to a hairdressers, we can help care homes create a cost-effective ‘memory lane’ of their own with our shop front murals. We can also, design and recreate almost any old shop facade or environment on request if you have something more suitable for your residents in mind. Heron Hill Care Home chose our post office mural for its residents. They said, “The murals have been just perfect for what we wanted, and have made great personalised spaces for our residents”. It’s not just old photographs and shopfronts that our customers look for. With the growth in good quality digital imagery, it's now easier than ever to re-create local landscape scenes as wallpaper. For instance, you might want to capture local parks and gardens, old town halls, railway stations, harbours and other local attractions and bring them to your care home. We have a variety of scenic landscape murals that are great for bringing a bit of the outdoors in. 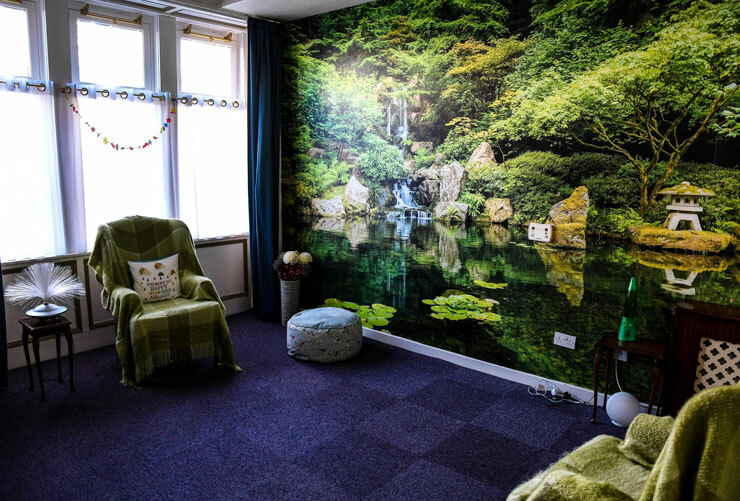 This care home chose one of our relaxing landscape murals to bring serenity to its lounge. Our landscape collection comprises of coast and countryside imagery to tropical lagoons so there are lots of choices depending on what you think will suit your residents. Along with our vast choice of imagery, our murals work in care homes for many other reasons. First of all, they’re available on a choice of three materials, including paste the wall wallpapers and a peel and stick wallpaper which allows you to easily remove if you’re looking for a temporary design. All of our wall murals are also supplied in evenly, pre-cut panels so that installation is simple and an expert decorator isn’t necessary. Secondly, our wallpaper materials are commercially graded meaning they’re wipeable so they can continue to look new and they also hold fire-resistance ratings. We hope this blog post has inspired your care home décor. Head to our care home category to view our full list of suggested murals for people living with dementia. For further help and advice n choosing the right murals for your residents, you can contact our studio team. Alternatively, we’d love to hear your thoughts and ideas on care home décor in the comments box below. Thank you for your comment Kiora and apologies for the delay in getting back to you. I've just popped you an email with the address you've left.